While 2017 MBHOF inductee Bernard ‘Bunny’ Paradis was a standout three-sport athlete at Old Town High School and played on college teams at nearby University of Maine in Orono, when you see or hear the name Bernard ‘Bunny’ Parady, you think Mount Desert Island. For almost four decades, starting in 1954, Parady devoted his career to the Mount Desert Island community as a coach, educator and friend. He was the face of MDI sports, coaching basketball for 26 years and also coached some baseball and cross country along the way. Parady would then become the school’s athletic director until 1991. Even today the Parady name lives on as kids play in the Bernard ‘Bunny’ Parady gymnasium at MDI High School, named in his honor in 1993. ‘Bunny’ was born in Old Town in 1930. After a great high school athletic career he went to UMaine in Orono where in lettered in three sports. He graduated from Maine in 1952 and earned his Masters Degree in 1963. For 26 years, from 1954 to 1970, Parady captained the hoops program, first at Mount Desert High School and then helping to smooth the transition to the consolidated Mount Desert Island High School. His Mustangs and Trojans teams made 23 tournament appearances. 360 wins. 40 tournament game wins. Seven Eastern Maine titles. Four state championships (1958, 1959, 1960, 1965) – in three different classes. Parady was named ‘Coach of the Year’ three times and in 1985 the Maine Association of Basketball Coaches honored him during the annual Senior All Star Game with the ‘Contributor of the Award’ for his longstanding contributions to the game of high school basketball. After his coaching days, ‘Bunny’ guided MDI sports as the athletic director. 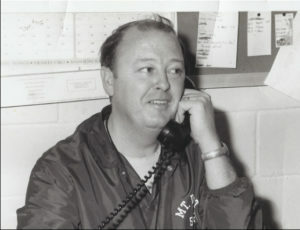 In 1984 he was named ‘Athletic Director of the Year’ by the Maine Athletic Directors Association (now MIAAA). Among the other honors for Parady, induction into the Maine Sports Hall of Fame (2000), the Maine Sports Legends Hall of Fame (2004), the New England Basketball Hall of Fame (2015) and James R. DiFrederico Award (2001) for contributions, sportsmanship and fairplay. Bunny and his wife, Elizabeth, are both deceased.